Network simulation covers a wide range of different concepts. However, there are two main network simulator concepts: a software program simulating the interaction of network devices and equipment to simulate a network with real data. The network simulator software is to test the end to end application behavior on different network designs. Again the network simulation is done completely in software. The other network simulator is to test application performance with real data. Even though it is more accurate to call real data testing as network emulation, most people still refer it as network simulation. A WAN Simulator or WAN simulation allows one to study the real world effects on an application or device in the lab by emulating every wide area network condition. Some examples of network simulator applications include: enterprise networks, satellite networks, networks with remote data centers, service provider networks, networks with cloud based elements, and application based networks such as video delivery services. Just as testing with actual real data vs. software provides a closer alignment to “real network” testing, testing with live traffic vs. synthesized data gets even closer. Network devices operate differently depending on the interaction with the traffic. It is common to see a router affect live traffic differently than synthesized video traffic and therefore it is best to get as close as possible to the real network to ensure all issues are fully tested and reduce deployment risk. 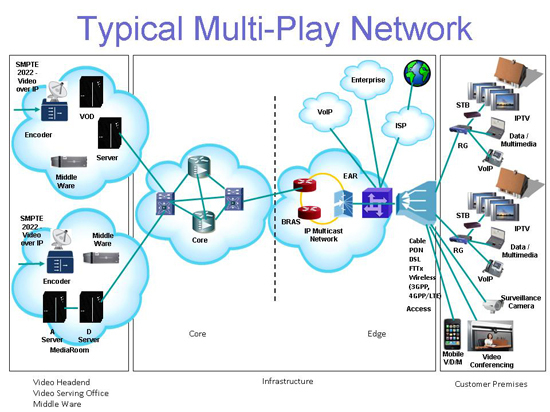 On the right are two diagrams: a typical multi-play (voice, data, video) network and some of the elements to provide a complete network simulation. 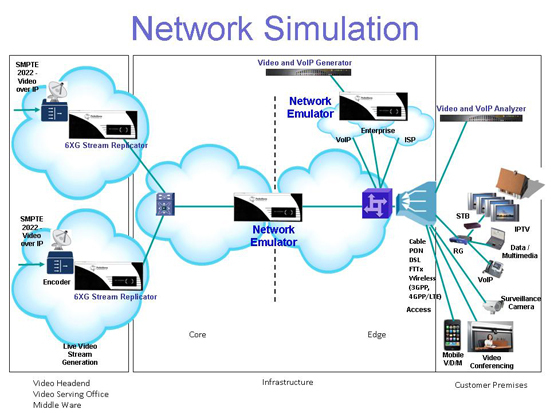 The network simulator diagram includes the following simulation elements: stream replicator, network emulator, and video/VoIP generator and analyzer. There are certain key aspects of each piece of equipment to ensure a complete network simulation. The stream replicator must provide the following capabilities: accept multiple input streams, replicate the streams, modify the streams, and output up to line rate capacity. Being able to accept multiple input streams allows a mixture of different types of streams in the network simulator. Stream replication must be performed exactly to retain the stream characteristics of the input streams. Modification of the stream header fields makes replicated streams as totally different to other network devices even though the payload is the same. Lastly, the main purpose of the stream replicator is to load down the targeted network devices and stress the devices to the highest level. The network simulator, also referred as a latency simulator or latency generator, is the core element to network simulation. The network simulator can be separated into the following functions: interfaces, filtering, impairments, network metrics, and routing. Using the actual interfaces of the real network in the simulator helps to simulate the effects at the edge of the network. Filtering allows multiple networks to be emulated even between the same two ports. Impairments represent the lumped model of the real network characteristics. Core impairments include delay, jitter, loss, throttle, and fragment. Network metrics include the functions that make the network simulation much closer portrayal of the real network. Network metrics functions include the capability to re-create the delay and loss characteristics of the real network, mesh network emulation where any packet from any port can go to any other port, dynamic emulation which emulates the changing condition of the network, and flexible user interface architecture that can re-construct any network topology. The routing function determines the delivery destination of the packets and should be able to look transparent or like other network devices to the test network. The VoIP/Video generator and analyzer provides the final piece of network simulation. It is comprised of three functions: range of traffic types, stateful generation, and network analysis. Even though the product is widely used for its VoIP and video generation, it should also be able to generate other types of traffic such as HTTP, POP3. SMTP, DNS, and DHCP. Stateful generation stresses the targeted device in an actual interaction just like it happens in the real world. Stateful generation answers the following question: how does the equipment perform when interacting with other devices at the application layer? Network analysis is conducted by measuring the quality of the VoIP or video conferencing calls when impacted by the emulated network. No matter if it’s called network simulation or network emulation, the key is to test as close to the real world as possible to minimize deployment issues and maximize revenues.